The engineer on Union Pacific Extra 3985 East briefly surveys something in the distant landscape before returning his gaze to the track ahead. We’re a few miles east of Laramie, Wyo., climbing the west slope of Sherman Hill — the route of the nation’s first transcontinental railroad. The weather is chilly with a mixture of rain and light snow, but that doesn’t faze the big 4-6-6-4. She’s hitting her stride at 40 m.p.h. on the grade with 80 dripping refrigerator cars full of California produce between the rear pin of her pedestal tender and the yellow caboose on the rear. 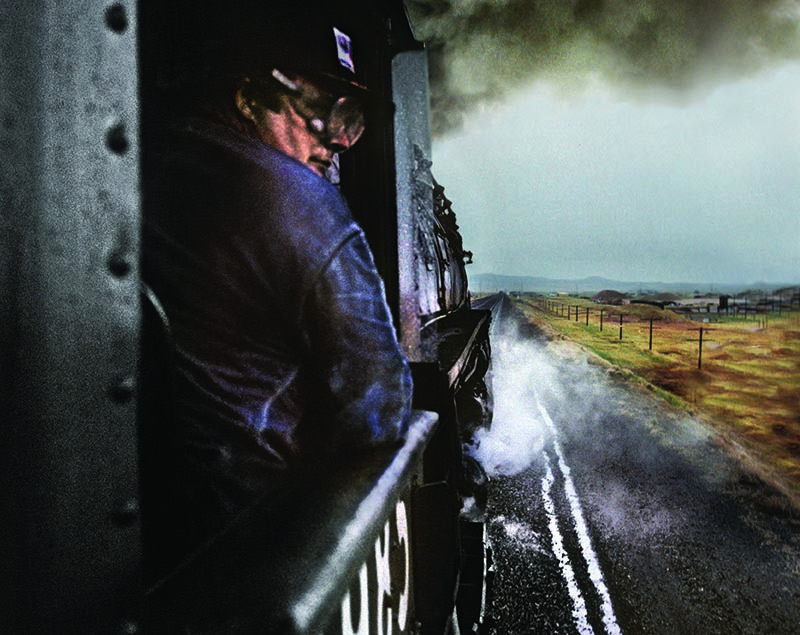 The hoghead’s facial features are etched by soot from the stack of the coal-fired Challenger, and a pair of goggles protects his eyes from the constant barrage of hot cinders coming from the twin stacks 60 feet ahead. It’s a high-decibel, teeth-chattering cacophony of sound. Welcome to American railroading in the golden age. In reality, this shot was taken on May 24, 1987. Thirty years ago, I first met fellow Kentucky native Steve Lee. At the time, he was working with Union Pacific’s steam operations, a program he would take over just two years later. Why was I in the cab? Steve issued an invitation before my trip out West. “I’d love to talk to you about doing an Illinois Central painting for me. I’ve talked to Howard Fogg, but that’s way over my budget.” I suggested we could talk — in the cab of 3985 — and I would do the painting at a fraction of the cost Howard would expect. “That’s a deal!” Clearly, Steve was expecting Saks Fifth Avenue quality, but he was willing to settle for something Dollar General to fit his budget. Steve Lee is one of the finest professional railroaders and friends I’ve known — and I’ve been around a lot of ’em in my life. 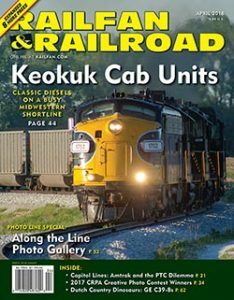 His railroad career started on the Illinois Central in 1972 as a fireman, then a trainmaster and road foreman on the Rock Island, and finally, as a general division road foreman at Cheyenne for the UP. When I first met him, UP’s steam operations were on thin ice. With the practiced diplomacy of a statesman, he molded it into the heritage program that has taken on the restoration of Big Boy No. 4014. Without Steve, there would be no such program today. After retiring at the end of 2010, Steve went to work for Wasatch Railroad Contractors in Cheyenne. The company does all kinds of contract restoration work all over the country, and that work brought him back to his home state of Kentucky for a couple of projects. Most recently, Steve was involved with the restoration of Louisville & Nashville 0-8-0 No. 2132 in Corbin. When Maggy Kriebel and graduate intern Jeff Cawood at the Corbin Tourism and Convention Commission pulled off the impossible and convinced the City of Bainbridge, Ga., to donate 2132 for repatriation to the state where she was built and operated, they asked me, “Now what?” My response was immediate — “I know the guy, and I’ll call him.” Since then, Steve and I have worked together on virtually every detail of the project. My role was the L&N technical guy, Steve does the real thinking. It’s about a 10 percent to 90 percent split of responsibility, with me being at the short end of the knowledge curve. Thirty years ago this image, captured at 1/250th of a second at f4 on a frame of Kodachrome 200 film, recorded the beginning of a friendship that has now spanned three decades. With my late friend David DeVault, we hatched the ambitious idea to have 3985 pull the 50th running of the famed Clinchfield Santa Claus Special in 1992, a year after this shot. David and Steve handled the corporate politics between UP and CSX, while I drew up lettering diagrams to convert the big engine to “Clinchfield 676.” The chances of anyone pulling that off today aren’t slim and none — they’re just none. Because of David and Steve, I was able to assume this same spot on the same locomotive as it crossed the former Clinchfield Copper Creek Viaduct. Like Sherman Hill, I’ll cherish that moment until I die. So, this is for Steve. Thanks, buddy, for all you’ve done and continue to do for preserving pieces of American rail history for all of us. 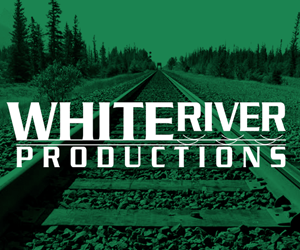 And here’s to our continued affiliation on the best thing in our lives — railroading. Thanks for the cab rides, the jokes, the education, and your friendship. I’m also glad you loved that IC painting.